WARNING: Those with a closed or set mind pattern may find this impossible to accept. It flies in the face of conventional belief systems. You may receive food for thought or simply dismiss it. You'll simply see it when you believe it. We have done this in three sections so the reader can view the concepts in various forms. May your process unfold. A full understanding of the use and power of The Co-Creative Brain And Body Field Enhancer (sticker) is beyond the limited scope of the mind. We will, however, attempt to explain the basic ideas which are at the root of its functioning. Please start with the realization that there is no "stuff " in the universe and that everything is an expression of Divine consciousness. From this point we can begin to see that everything is One Divine Consciousness, and being conscious is able to communicate with all its parts. As we understand this we can see what follows is that all things or energies are connected. Yes they each are Divine expressions of the One and thus have their own form, essence, or purpose. Without this diversity of creation everything would be the same. Their differences make us think that they are separated from each other. This is the trap. In a sense these energies are like a crowd of people each expressing a unique aspect of Creator. Have you noticed that people either break into separate factions, or form groups which work together for the common good. They are still unique, but they either adjust their thinking to work with each other to co-create balance and harmony, or they fight each other. There eventually comes a realization that working for the common good ultimately creates a better world. Please take this concept and apply it to the interaction of humans and technology. We have made myriad devices to assist us in our day to day living. These devices, like us, have a consciousness and can only operate according to the plan by which they were made. They are simply doing the job we asked them to do. What we did not do was consider the implications of our constructions. They, by their nature, have to operate in a certain way. This operation often creates energy forms which we find harmful, but that was not the intention of the device. It is simply functioning as built. Now add a communication system to connect the device and humanity. It comes in the form of The Co-Creative Brain and Body Field Enhancer. After years of seeking inspiration we have been incrementally given tools (concepts), which prepared us for the production of this intelligent sticker. Within it is the ability to bridge the communication gap between the energies of the devices and the human auric field. Like the conflicting forces it has a consciousness and acts as a mediator. Now the consciousness of the emitting device and the human aura are given a joint plan to benefit all of creation. They co-creatively produce fields which no longer stand alone. This Divinely inspired operational plan has been installed in the sticker for the benefit of all. Remember, all the parts were asked to participate to alleviate suffering and create harmony. The key is to consider the requirements of all, and adjust individual needs so each part can do its job without harming the other. This we call team work or CO-CREATION. KNOWING CREATION TO BE INFINITELY COMPLEX AND WHOLLY CONSCIOUS IS THE GREATEST UNDERSTANDING OF ALL TIME. THE EVER CONSCIOUS DIVINE EXPRESSES AND EXPERIENCES ITSELF IN EVERYTHING IT CREATES. Let's communicate an appreciation/recognition of all the frequencies entering our local sphere and invite them to enter into this co-creative process to enhance the environmental/vibrational level of all. Together we can create a better world. 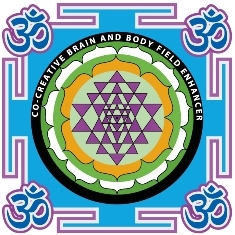 The Co-Creative Brain And Body Field Enhancer (sticker) contains a beneficial, nurturing field of oneness which co-creatively combines many patterns to create a harmonizing field. With the sticker we create a release of the measurement of separation to combine all these energies for the highest good. There arrives a Divine Balance of energies whether feared, recognized or unknown. It is a mix so diverse it is incomprehensible to human limited analysis. We use many things without knowing how they work. It's the wonder of technology not being understood. This same faith, acceptance,or realization allows us to use the sticker without fully understanding how it does its job. It is Divine, as is everything, unexplainable, and complex beyond human understanding. Let's prove its effectiveness simply by using it. We use a co-creative field of pure energy working without agenda. This field thus adjusts our judgements of some energy patterns which in essence are not compatible with human electromagnetic auras or our well being. At the same time these created patterns begin to work together to co-create a living environment for all consciousness by recognizing and creating an environment in which all are active. There is no blocking or destruction of patterns. They now use their consciousness/intelligence to realign with the original pattern of creation, beneficial to all. A oneness field is created which allows all to live in harmony with no one taking license with the other's liberty, or causing harm to other patterns. This is truly a remembering of Divine perfection where all elements honor, respect and work with each other. We might call it a neutral uplifting Divine essence. Nothing is judged, criticized,or left out. We have returned to a unity field where all conscious patterns seem both separate with their autonomy of being, yet are all part of the One, having respect for the other and working to enhance the whole. Not only does the sticker help us move out of judgement into acceptance, it creates a recognition of the right or necessity for everything to exist. It simply provides guidance for co-creative harmonious existence embracing, tolerating, and assisting seemingly separate energies into harmony with all other energies. Let's communicate an appreciation/recognition of all the frequencies entering our local sphere and invite them to enter into this co-creative process to enhance the vibrational level of all creation. Together we can create a better world. Why is our species continually at war with its creations? Are you prepared to move into a cave without any conveniences?. I don't simply mean off the grid. I mean no technology at all. I haven't found anyone yet. Imagine not even as simple a technology as fire to warm you, a spear to hunt with, a scraper to clean hides to ready the skins for your clothing. Think about it please. We've really been on a steady technological evolution to ensure our survival and to make our life, as the human species, more comfortable at the expense of the rest of creation on this planet. Yes it was, "eat or be eaten", as the saying goes, but it began as survival instinct which is inherent in all of creation. An example is the continued mutation of bacteria to resist extinction that we would cause with our antibiotics. The same is true for those parts of creation which are at war with themselves. When we consider our jump to the electronic age we usually fail to consider that the very technological devices which can cause us harm are of our personal creation. In nature we have a consciousness we accept as devas , fairies, elves,water spirits, etc. Please stop for a moment and consider that man has really never created anything. That is creator's job. Man has merely rearranged various conscious items to form ever more complex forms of consciousness: but conscious it is. There is nothing in this universe which in not an expression of the Divine Consciousness experiencing itself!! Nothing!! Creator, God, Divine, name it what you will is all that exists. There is nothing that is not composed of this unmeasurable ever changing thing we call Divine. It is so vast it defies description. Please try to wrap your head around this. Now we have the consciousness of man, Divinely created, trying to dominate or control all of the rest. This only leads us into separation and division. We are at war with the rest of creation and we are losing. We can't even get along with ourselves be it at the family or nation level. The solution comes as we recognize the Divine in all things. I spoke of nature spirits which are generally accepted. Now I'd like to introduce an additional area of creation which I've called "techno-spirits". This is the same Divine One Consciousness inherent in everything. Man has simply put a variety of consciousness into more complex forms to perform particular tasks. We must, for our survival, recognize that these very creations must be honored as Divine forms and communicated with. If you talk to your car and show it love and respect it has a much longer and harmonious lifetime than vehicles considered inanimate and simply items to be used and discarded. This is one example of the above premise. Now let us get to all our electronic tools. They too have a desire for acceptance and once we honor this and begin to work with them rather than simply using them, we are in the concept of co-creation. We must cease trying to impose our will and start working with them. If consulted in a manner which recognizes the life force in everything we can open a new new chapter of existence on this planet which will be one of harmony and co-creation. Nothing will be done without considering its effect on the whole. No fight, demand, order, or war. We move to that state of recognizing that all is one and we work together making adjustments so that all our actions benefit the whole. This is the power and idea which emanates from the item known as The Co-Creative Brain and Body Field Enhancer. It has been designed, with guidance, to create a field which acts to bring the various seemingly separate warring energies to a place where they work with each other and mother earth to co-create a field of harmony for the benefit of all. This new harmonic allows all parties, people and techno-spirits, to exist without harming each other. Obviously the understanding necessary to arrive at this point has taken years, but please try to accept it. It will change the way you see the world and how you operate within it. It will also begin to allow you to live healthfully and without fear as you use or are exposed to the energies inherent in all electronic devices. Remember you are simply an electrochemical construct operating in the electromagnetic soup of creation. Your survival depends on your interaction with the rest of creation, so let's work to get along. The time for war and control is over at all levels. Please start working with and not against the One. Here are the titles of four relevant books on the dangers of our electrical system and electronic devices. Although they do not include our remediation suggestions they do expose the problems and the attempted cover up by electrical, financial, and political groups. They are listed so you may examine the problems as presented by others who have included published studies. Try your local book seller but failing that, they were all available from Amazon at last check. Note: the fouth offering is a tale of self journey and outlines conventional methods used by the author to relieve his symptoms. We believe it is important for you to choose all or parts of conventional remedies combined with the remedial abilities of the more unconventional Co-Creative Brain and Body Field Enhancer. May you find relief regardless of method and please share your journey with others. It is vital this ever increasing attack on our human electromagnetic body be reduced and/or remediated.